BrainHost.com Reviews - Legit or Scam? BrainHost.com Reviews – Legit or Scam? Having a website is important in today’s technology driven fast-paced society. Websites are used for more than promoting a company’s product or service. Whatever the case may be, Brain Host provides hosting for all types of websites. Hosting a website refers to the concept of making your site accessible through the World Wide Web and providing space on their server for your site. 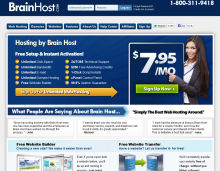 Brain Host provides 24-hour customer service, support and various resources for free. They also offer a 30-day money back guarantee. Their basic package, which costs $7.95 per month, includes unlimited disc space, unlimited email accounts, unlimited bandwidth, an unlimited number of hosted sites, and an uptime guarantee of 99.9%. This is the standard package of most hosting sites. Hosting a website is often confused with designing, coding, and programming a website, the latter being considerably more expensive. Brain Host can provide additional services and upgrades for your site, but these are not free. If you don’t personally have the skills to program and design websites, you may want to consider hiring someone to help. When it comes to websites, it can be hard to comprehend what happens beneath the surface. If you sign up with Brain Host, a company that is used to HOST websites, the probability of incurring additional costs is highly likely, especially if you are not able to manage the site on your own. Even if you have a site and don’t want to make changes to it, remember, plans change. Comparison-shopping is the best way to decide if you will allow them to take on the role or if you will pay someone else to do it. If you have the intention of using a website with the hopes of seeing any desirable results, you will need to pay for it. When you hear, “You get what you pay for”, this is what they are talking about. Websites need regular scheduled updates incorporating technological advancements and current trends. Information is available through the web to help you get the most out of your website. To maximize your website’s potential, learning the correct terminology is going to help you clearly and accurately communicate what you want, and understand what you are receiving, a great resource is TechTerms. Learn the language prior to signing up for any web design, programming and hosting services. It is common for individuals to receive their credit card bill and zoom in on a charge from their website hosting provider with complete shock; however, they apparently did not read the fine print. When you ask for additional services, you are going to pay, if you accept additional services, you are going to pay. Nothing is free. Average Rating for " Brain Host " is 1 out of 5 based on 1 reviews. Did you ever get your money back? My dad has been scammed too and I am struggling to understand how he ended up with this website of Country Music in the first place - completely random! And they have charged him almost $800 which seems to be an annual fee! ?